It is always advisable to use a specially made fabric marker when lining out fabric for quilt-making. 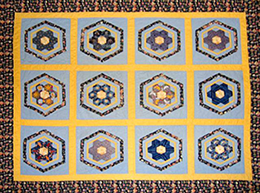 If you use a marker that is not intended for fabric then it may not wash off and can spoil the overall appearance of your beautiful quilt. Depending on the fabric composition it is ideal to use pencils, chalk and water-soluble markers. If at any one time you are unsure, mark a small scarp of the the same material, wash and see if you are happy with the results. It is always important that you mark a scarp of the same fabric you will marking for you final quilt as if you use a different piece of material it may have a different composition (e.g. 100% cotton vs 65% cotton and 35% rayon) and may be more or less susceptible to keeping the mark. Chalk is a great option when marking your quilt as it will generally wash out of most materials. Once again it is a good idea to do a test run of a bit of scrap fabric. Chalk is generally a fairly muted color and therefore will be quite a pale marking (if you use color vs white!) on your quilt. Chalk tends to become blunt fairly easily and can be difficult if you are marking something detailed or intricate. It is often best left as a simple fabric line up marker and it is recommended that if you want to draw something in detail then use a fabric pencil. Fabric marker pens are designed solely for the purpose of drawing on a variety of fabrics and then washing off or fading in time. They are a fantastic way of securely marking your quilt knowing that you will not have any surprises when you wash it later on! Always check the instructions before using a fabric marker and try to minimise the amount of time between usage and washing. © 2019 Quilting101. All Rights Reserved.